Mr. Sagawa leads the Technology, Media and Telecom practices at SSR. He has worked in and around the industries for over 20 years, including his 11 year tenure as a senior research analyst at Sanford C. Bernstein. While at Bernstein, he was named to the Institutional Investor All-Star Team in three different categories, including the number one position in wire-line communications equipment after his prescient call in September 2000 noted that cash strapped telecom carriers would be unable to pay for technology purchase commitments and correctly predicted the subsequent collapse in the sector. In his most recent position at Bernstein, Paul conceived and launched a new business area as the firm’s first Small Cap Equity Strategist. Prior to Bernstein, Paul spent six and half years at McKinsey and Company, rising to the position of technology sector specialist in recognition of his communications industry acumen. His earlier experience includes three years as a sales representative for AT&T’s equipment business. Paul earned his BA in Economics and MBA from Harvard University. In order to understand dynamics at the sector, subsector and firm level, we monitor relative valuation and share price performance throughout technology, media and telecom. By tracking firms relative to their (cap-weighted) subsectors as well as subsectors relative to their sector and the broader market we are able to highlight high and low outliers, track variability in relative performance and steer our analysis to the most investable opportunities. To do demonstrate this, we maintain and track quarterly model portfolios based on themes identified in our research. We typically add and remove constituents each quarter, and track performance between updates. Our TMT AI heatmap as well as long model portfolio appears below. 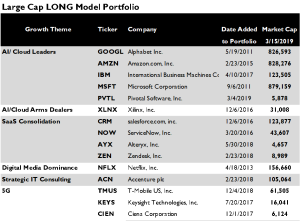 Model Portfolio Update: What is Value in Tech? Model Portfolio: Is It Safe? Quick Thoughts: AAPL – Pay No Attention to the Unit Sales Behind the Curtain! Quick Thoughts: QCOM – Now What? Quick Thoughts: Who’s Buyin’ Who? IBM: Are We There Yet? TMT Model Portfolio Update: What next? TMT: Model Portfolio Update – NOW WITH SHORTS! Quick Thoughts: QCOM – How Many Shoes are There to Drop? Quick Thoughts: QCOM – Are We There Yet? Quick Thoughts: TWTR: Jack’s Back, What Now? SaaS Applications: [Subscription] Software is Eating the World! Sensors: What’s in YOUR Smartphone? Consumer Data: It’s Not Just What You Have, It’s Also Knowing What to Do With It. TMT: Portfolio Update – Sooner, or Later? US Telecom: Merger Mania! Telecom Bankers Rejoice! 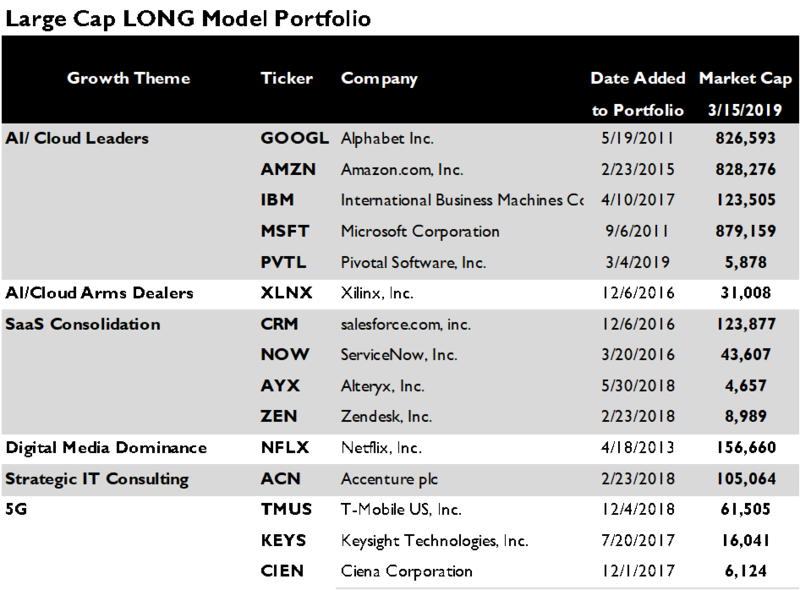 TMT Portfolio Updates: The IPOs are Coming! The IPOs are Coming! Apple: Can a Leopard Change its Spots? Wireless Carriers: Will the iPhone5 or New Spectrum Revive Carrier Competition? Cloud Data Centers: Bigger, Faster, Cheaper! The Open Source Software Threat – Wait, It Gets Worse! Portable Devices: Smartphones, and Tablets and Netbooks, Oh My!